Dunyazade is a proposed beach cruiser. Thank you. Yes, this would be a good rig for a yawl’s mainmast. I haven’t had the chance to use it that way yet. It all depends on the boat! 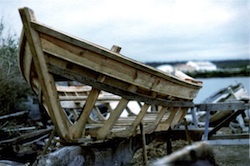 As to the boat, starting from the beautiful designs I found on your website, one could imagine for example a smaller version of Kathleen Gee or a revised version of Robert Olson’s 15′ dayboat. I am actually trying to build something similar by myself, however for simplicity I am using plywood on a hard chine hull design. Anyway, yawl rig for sure and possibly no boom, possibility of multiple mainmast positions to let the sailplan be balanced with just the mainmast or both mainmast and mizzen, the choice depending on weather conditions and crew composition. Full sailplan would be made of six sails, including a mizzen jib, balancing the forejib. Sounds a bit complicated but it might work after all, what do you say? It could work. The problem with a miniaturized rig is that you lose sight of the reasons for breaking up the sail plan are based on keeping the sails small enough to handle. When the boat is small and the sails are already small enough to handle breaking them up into even smaller units costs in efficiency of the sail plan as well as in time and money spent on making multiple sails and spars when larger units would do the work. One way to minimize these effects is to make sure that you take the smaller sized sails and their lower strains into account and use simplified rigging arrangements like single-part halyards and simpler or no standing rigging. If the rigging is just miniaturized following larger model’s practices then it results not only in a more expensive and less efficient rig, but one that is actually harder to sail. A rig like Dunyazade’s does take these points into account. Thank you for your comments, I completely agree with you! Assuming to use a spritsail main, I would be happy to avoid a topsail if I could keep the same total sail area and mast height, but this would imply quite a high peak and a long sprit: to what extent could throat angle and aspect ratio of a spritsail be pushed in your opinion? Is it important that the sprit bisects the peak angle? If not, how high can be placed the snotter cleat on the mast if you want to limit the sprit lengh? The four-sided spritsail’s geometry lends itself to low aspect sails. A sprit obviously needs to reach down far enough to be handled and managed so it can’t be too short. I think it does need to bisect the angle of the peak. Otherwise it will either flatten the upper part of the sail too much or create too fat a belly. One of the most important aspects of designing a rig is having a sense for when a particular type of sail is most suitable and when the requirements of the boat as a whole are leading us some other way. There hasn’t been much of that going on since the jib-headed Marconi sail was decided to be the one-and-only “efficient” sail. We are beginning to see a movement away from that shape in racing. Efficiency must always be tied to the question, Efficient to what end? I read somewhere that the Marconi rig acquired its predominance thanks to racing sailboat rules that favoured this kind of sailplan. Being used in competitions, it was automatically assumed as the best available and spread itself also in the market of cruising boats. I think that spritsail is a quite interesting rig for small boats due to its simplicity and I also found a paper with good results about its efficiency (http://bateaubois.free.fr/file/rigs.pdf): I do not know if these results, obtained with a catamaran, can be applied to any kind of hull, but they are encouraging anyway. I realize that I have asked you many questions and do not want to try your patience much longer, but let me at least address a final issue, regarding something which I was hardly able to find information about in the literature, which is the “lead” the sailplan CE must have respect to the hull+rudder&board CLR. The scarce practical numbers that I have found on books or derived from actual small boat designs vary form 5% to 20% of LWL, even for very similar designs (hull and sailplan) with apparently no particular rule behind, do you have any suggestion for its calculation? What is for example the lead that you adopted for Dunyazade? Is it maybe something that on a small boat subject so much to crew weight and position is not so critical? I have always looked to either Skene’s Elements of Yacht Design: http://macnaughtongroup.com/skenes_elements_of_yacht_design.htm or Chappelle’s Yacht Designing and Planning: https://books.wwnorton.com/books/detail.aspx?ID=4294986033 for reference on the balance between CLR and CE. The process is quite straight forward. Understanding the results and making an informed decision on where to place the rig and centerboard does require some experience. Yes, on a small boat crew weight and position is a very important factor. 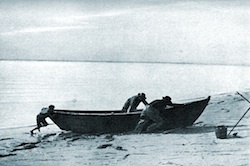 A boat can be steered by shifting the crew without using a rudder. But it is important to have the rig and board balance close to optimal. Otherwise you are always fighting the lever-arm of forces on the boat instead of using them to advantage. The variety of percentages of lead, as you’ll see in those references, is for various hull-shapes and rig combinations. Also the aspect ratio of the rig is a factor. All this goes well beyond what I can cover in a reply to a comment. It is important when starting out to keep precedents for similar boats that have good balance in mind and not to deviate from their lead. This is all part of what makes boat design so fascinating. Good luck!